Good Morning! I had the pleasure of spending the better half of Saturday working on a baby quilt for my husbands cousins wife. They are expecting their first child together and contacted me to ask if I'd make them a baby quilt. Obviously I agreed! I'm only sharing some progress pictures because I want the finished quilt to be a surprise for them. When we first talked, the mama-to-be had a few ideas about designs and colors and we made a Pinterest board to collect some ideas, but basically left the rest up to me. She asked for a chevron or triangle pattern in the colors: Mint, Aqua, Navy, White, Grey, and Apple Green. I pulled some fabric and shared it with her before I started and she was thrilled. 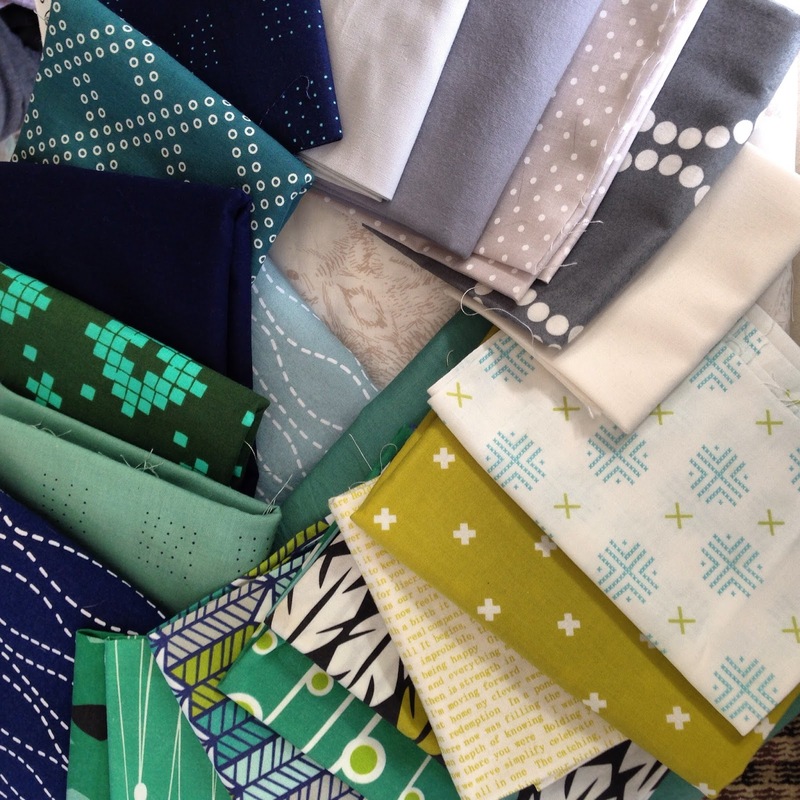 It's a mixture of Cotton+Steel, Lotta Jansdotter, and some printed fabric from Modern Yardage. (On a side note: the Modern Yardage fabrics suggest prewashing. The colors faded pretty significantly. Not sure if I would try fabric from them again.) 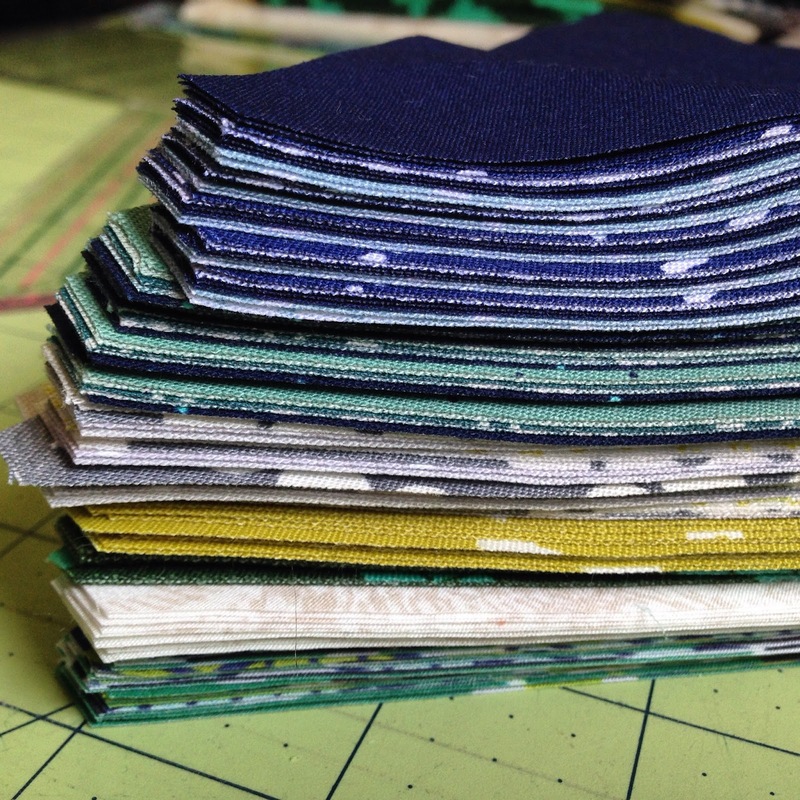 In less than an hour I had a lovely stack of triangles ready to sew up. I laid the pieces out into rows on the floor. 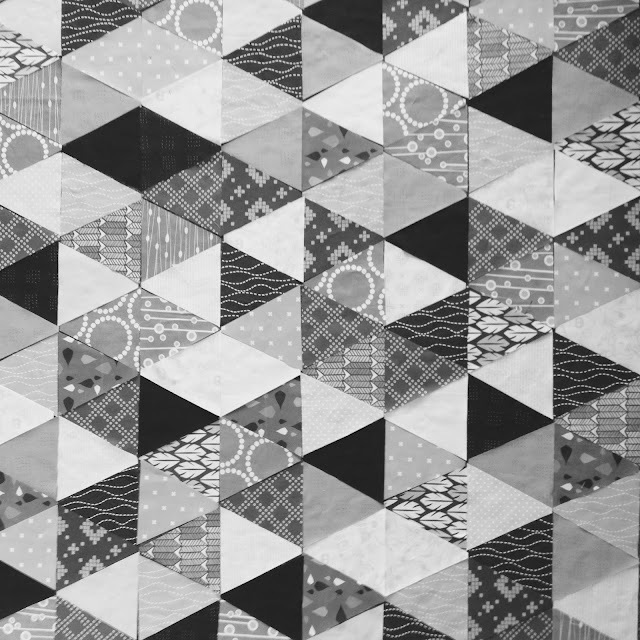 A quick black and white photo ensured that the different values were spread out and I was ready to sew. I just love how quickly these types of quilts sew up. Especially in a baby size. By about 4 PM I had a finished quilt top ready to go! On Sunday afternoon I pin basted the quilt, using two layers of batting to help make it extra soft and cuddly. 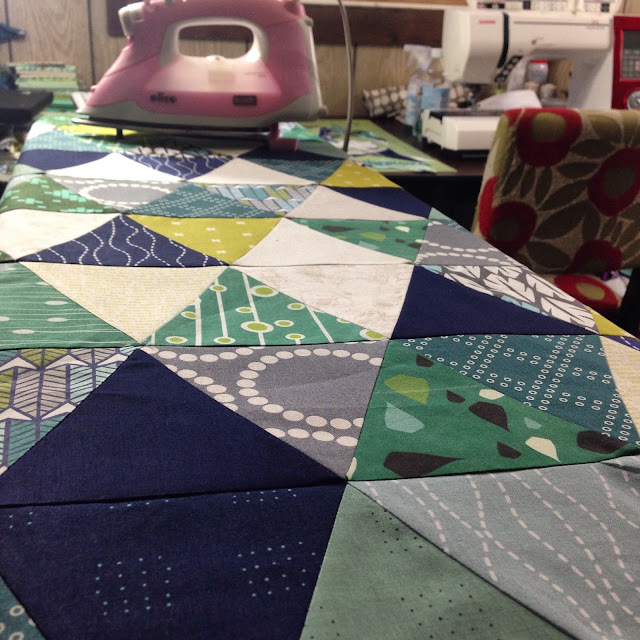 In less than 2 hours I was able to finish about 75% of the quilting. 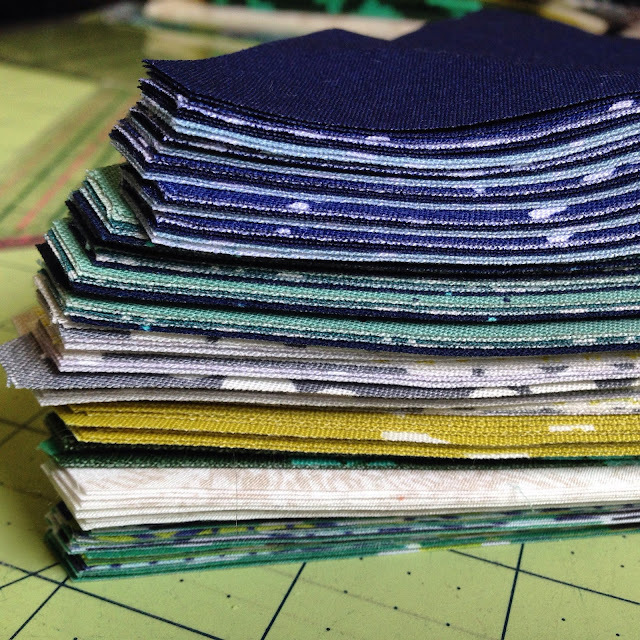 I'm using a grey/blue aurifil thread and echo quilting on each side of the diagonal lines. Quick. Easy. Satisfying. I had hoped to finish this up this week and use the rest of the time until her baby shower to make a bumper (I'm hoping to channel my inner Rachel) and a few other surprises for the parents-to-be but life threw a curve ball at us. On Monday, my husband was hit by a truck while cycling and is currently in the hospital recovering from arm surgery and a partially collapsed lung. He is in good spirits but tired and sore. He has no broken bones and just some scrapes and bruises besides the lung and arm. We acknowledge how incredibly lucky he is. All things considered, this is the best case scenario in a bad situation. They expect he'll make a full recovery but for someone accustomed to being highly active this will be very hard for him. In the meantime your prayers would be appreciated. 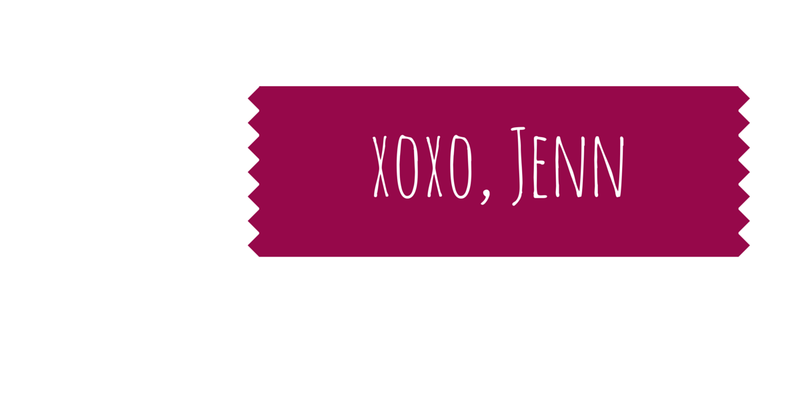 Oh goodness, Jenn, prayers definitely headed out for your husband and you! That is so scary. I'm so glad he's doing okay! That is so scary. The quilt looks great so far, and the new parents will love it. 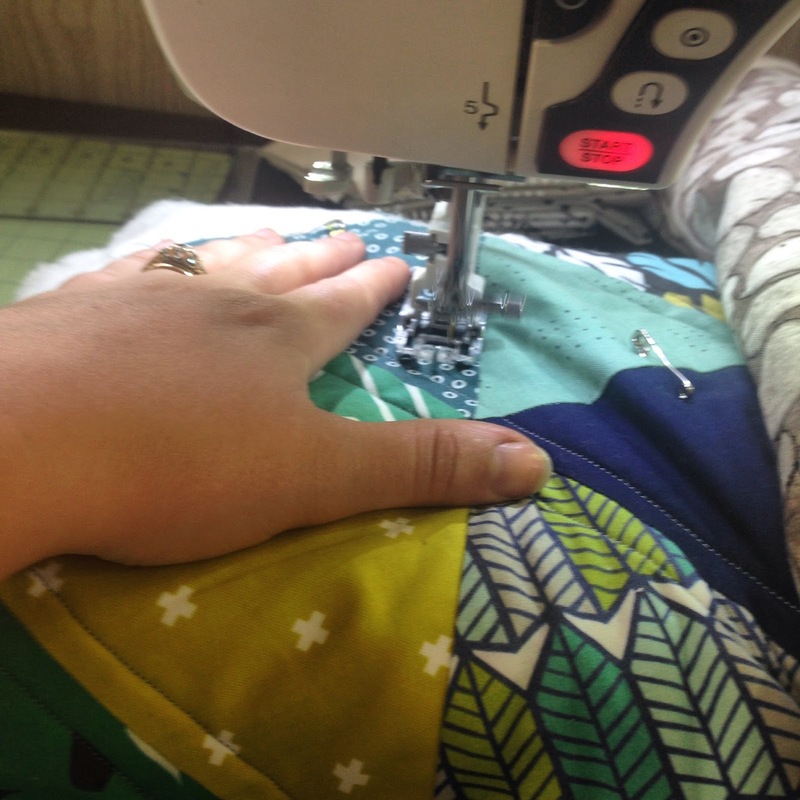 And it's probably nice to have some sewing to distract you now. I will pray for your husband's recovery. I'm so glad that he survived, but awknowledge that being hit by a car is never "fortunate". I like the pretty color scheme and nice contrast you have going in the quilt. my prayers are with you and your husband for a quick and full recovery. thanks for the peak at your wip - I don't think I could make such fast progress on a quilt ! Ouch - hope he recovers soon. thoughts are with you and thankfully he is on the mend. So sorry for you and your hubby - Prayers are coming your way! I think your quilt is fantastic. The colors look so good! Is there a pattern for the quilt? Praying a speedy recovery for your hubby! I love this quilt. It reminds me a lot of one I finished at the beginning of the year for my new grandbaby. It did not go together as quickly as yours though. You are super fast! What size triangles did you use? Did you cut by hand or accuquilt? Oh my! I'm glad to hear he's doing okay, though that must have been terrifying for both of you. I'll be praying for a speedy recovery. Your quilt is looking beautiful! Oh my, so sorry to hear about your husband. My son is a bike rider and I always worry about this. Glad he is on the mend! I hope your husband is recovering well. That must be terrifying. Sending my prayers. p.s. The quilt is absolutely lovely. Can't wait to see it all! My husband is a cyclist too. It can be scary on the roads for them. I hope your husband makes a full recovery soon. Isn't Pinterest great for planning?! When you are making something, you want all your hours of effort to create something the recipient will love and use. I am sure it will be appreciated.